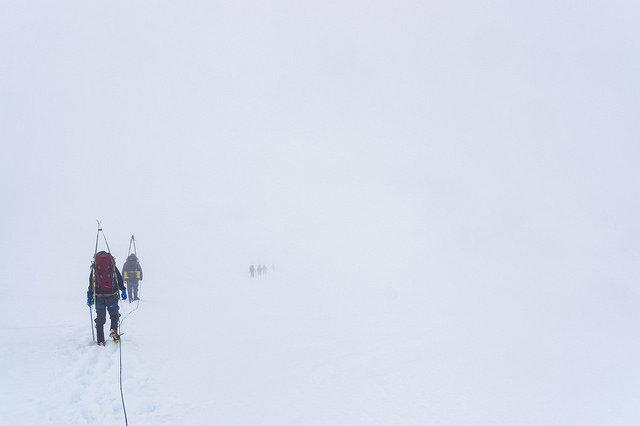 White out fog during a traverse. Mountaineers affectionately call this "Ping Pong Ball Weather" because it feels like you're standing inside a ping pong ball: flat and white in every direction. PC: Daniel Otto. Weather on the Juneau Icefield is a tricky thing to work with. Overall, anyone who has worked in Southeast Alaska will tell you it's rainy. When people say rainy, they mean it! Southeast Alaska averages about 3 m/yr of rain; that's roughly 3x as much as the East Coast of U.S., and about twice as much as the Pacific Northwest of the lower 48. There is regular precipitation year-round in Juneau, and the summer is certainly no exception. We will likely get many days of rain this summer, and very possibly a few days of sleet or snow. We will also likely get many cloudy/overcast/foggy days where it isn't exactly raining, but everything feels damp. Everyone on the JIRP expedition works hard to keep their clothing dry-ish, and all of them slip up at some point. With careful planning, experience, and attention to detail it's possible to keep control of damp clothing. The staff will teach you as many of these strategies and tricks as you can remember during orientation. A sunny day of geophysics research. Note the skiing in shorts- popular on hot days, but not recommended for sun protection. We require long pants when there is significant danger of crevasse fall, so do your best to find a set of light long underwear bottoms! PC: Daniel Otto. To balance out the rain and damp, many days on the Icefield are sunny. The sun feels lovely, and all JIRPers jump at the chance to dry their clothes when the sun comes out! Unfortunately, the sun is a double-edged sword. Snow reflects a significant portion of solar radiation - in glaciology we say it has a "high albedo" - and JIRPers who aren't careful can end up with unusual sunburns very quickly. We will go over sun protection during orientation (have you ever put sunscreen up your nose before? ), but while you're getting ready for the expedition try to find a set of base layers that are light weight (so they're not too warm) and light colored (so they don't absorb heat from the sun), as well as a comfortable pair of high quality sunglasses. Temperatures during the field season will vary dramatically. Hot, sunny days can get up to 80 F/25 C. Believe us when we say that a sunny day at the beach will not feel as hot as cross-country skiing on a hot sunny day with the snow reflecting the sun back up at you. Exercising in the sun on a giant mirror is no joke! At night temperature can drop below freezing, but it likely won't ever get deeply cold. On clear nights we may see temperatures down to 20 F/-5 C, but it's rare for it to get much colder than that. Most days on the Icefield will probably be pretty moderate: 40-50 F/5-10 C and overcast or drizzling. Veteran staff and faculty eat dinner in their (synthetic) puffy jackets at Camp 10. An extra puffy isn't required, but most people enjoy having one for when it gets chilly at night. 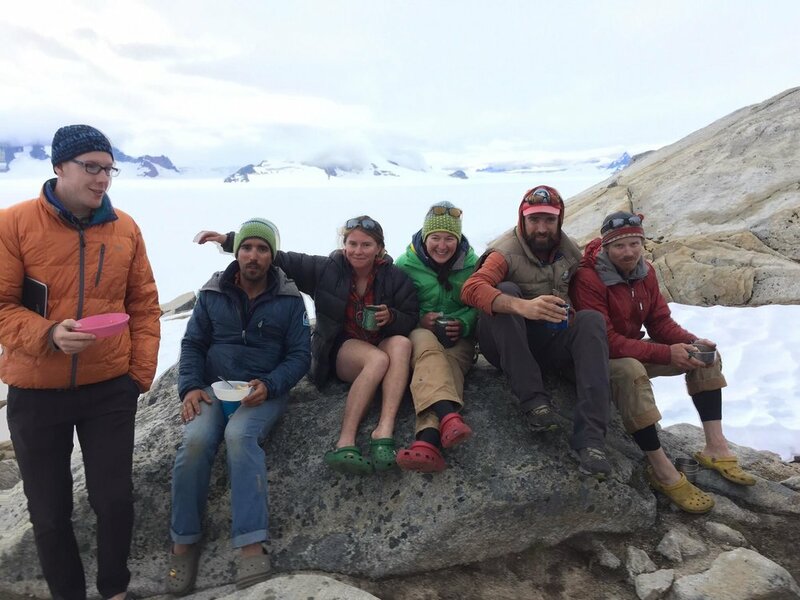 Watch out for these JIRPers this summer, every one of them is full of tall tales of bad weather days on the Icefield! PC: Paul Jerard. The Icefield will probably throw a little bit of everything at us this summer: some hot days, some cold days, some sunburns, some strong wind gusts, and a moderate risk of hypothermia. The staff will teach you how to comfortably live, work, and travel in these conditions. We go out almost every day, and you'll get used to taking care of yourself outside in Southeast Alaska. It's not always fun while it's happening, but it's usually fun to tell stories about when you make it back to the cookshack for hot dinner with your friends.